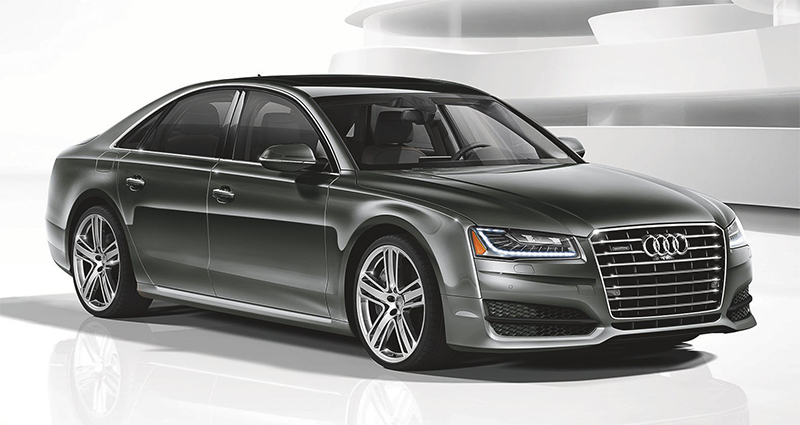 Featuring more power and enhanced luxury inside and out, the Audi A8 L 4.0T Sport model enters the Audi lineup for 2016. The variant of the Audi A8 flagship sedan boasts an enhanced 4.0T twin turbo V8 engine achieving an impressive 450 hp, an increase of 15 hp from the previous 4.0T model. The Sport model also includes a muscular front fascia with larger air intakes for a more commanding presence on the road. The bumper of the A8 L 4.0T Sport has been lowered for a more performance-oriented look and the sides of the sedan have been given more prominent rocker panels to give the vehicle a wider stance. On the rear of the car, the lower bumper has been reshaped for a more dynamic appearance. The A8 L 4.0T Sport comes standard with 20’’ 5-double spoke wheels and is available with two additional 20’’ wheel options. Also available are 21’’ 5-arm wheels with summer tires. The interior of the A8 L 4.0T Sport model has been designed for ultimate comfort. The standard Executive and Luxury packages offer 22-way Comfort front seats with Valcona leather and a sporty diamond pattern stitching. The front seats also include ventilation and massage functions. Also standard is an Alcantara headliner, panoramic sunroof and acoustic glazing on the windows creating an interior experience that is more luxurious than ever. Innovative Audi driver assistance functions include Audi side assist with pre sense rear, which can aid the driver when changing lanes and helps monitors the traffic following the vehicle and Audi head-up display with navigation information. Also available is Audi adaptive cruise control with stop & go. *Prices above exclude destination charges ($925), taxes, title, optional equipment, and dealer charges. Dealer sets actual price.